The Lotus marque is now legendary, and you cannot mention the name Lotus without thinking of the man behind it all – Colin Chapman, a man now justly regarded by many as a legend in his own all too short lifetime. Colin Chapman was born in Richmond, Surrey on 19 May 1928. During his childhood he developed an interest in the the motor car and also aviation. After leaving school he studied engineering at University College, London, where he attained a BSc. During this time at university he and a friend set up a used car sales business where they often between them improved and modified the cars that they had bought in before selling them on to eager buyers. It was in 1947 though that Colin Chapman embarked on building his first car - a “special” based on an early Austin Seven Saloon, which after tuning, took part in races and trials. After serving in the RAF until 1949, he continued work at his North London workshop on a second and third car, the Mk II and Mk III, which were also based on Austin Seven components and did extremely well in motor sport with Chapman himself winning many races in them. Built employing principals of aircraft technology that he had acquired at both at university and while in the RAF, these cars were very rigid while also being light resulting in remarkable performance and handling. The Lotus Engineering Company was founded in January of 1951 to cater for the many requests from those who wished to purchase replicas of this successful small car for use in motor sport. The space-framed Mk VI of 1952 was extremely successful selling over 100 models and endearing itself to many contemporary racing drivers. These cars were powered by mainly Ford or MG engines. Many more models were to follow including of course the Lotus Eleven that achieved class wins at Le Mans in both 1956 & 1957. Lotus were to achieve numerous victories in motor sport in the years to come. To increase the available funding for the companies racing interests, Colin Chapman decided to extend the business to include the building of road going sports cars based on his successful technologies. The first of the resulting models was the now much loved Lotus Seven, which was launched in 1957. This car is still in production today as the Caterham Seven. 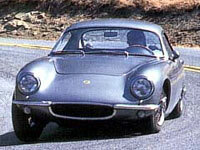 In the same year as the Seven, the Lotus Elite was also launched. This used a monocoque glass fibre shell and was a small sleek fixed head 2-seater of well balanced proportions. Demand for these cars exceeded the initial expectations of Lotus, and Colin Chapman decided to relocate the company in much larger premises in Cheshunt, Hertfordshire. The next new model after the move was to be the now legendary Elan. This entered production in 1962 and used a steel backbone chassis and fibre glass bodywork. Lotus continued their success story, both in motor sport and in the domestic market, and again moved premises - this time to Hethel in Norfolk where the current Lotus Elise is still produced today. Lotus had become a manufacturer of superb technically advanced sports cars, and many more new models were developed and launched to much acclaim in the following decades, including the Europa, Excel, Esprit, and the current Elise. It is sad to note that Colin Chapman died of a heart attack at the age of 54 in 1982. The Lotus Elite was introduced in 1957 at the Earls Court Motor Show, and was very well received by both the press public alike. The sleek and stylish bodywork was of an all fibreglass monocoque construction.